On Sunday morning June 5, 2011, I stepped into my canoe and pushed off from Kill Kare Landing. It was 8:30 and my friends Jamison and Gordy had already been in the water for a minute or so when we were beginning our trip down the Edisto River. Our trip began on the North Edisto upstream from Branchville, and we were looking forward to following the river all the way down its outlet at Edisto Beach. We had prepared ourselves with plenty of food, not enough whiskey, and a map that we had doctored with river miles and other useful information that we pulled from the FRED website. After getting comfortable in our boats and maneuvering through a few snags, we approached the waterwheel at the confluence of the North and South forks and the river widened. It being our first day, we planned on paddling hard until late afternoon and then start looking for a nice sandbar to camp. We started seeing numbered duck boxes marking the river miles a few miles upstream from Hwy 21 and we were able to determine our pace. A few miles below Hwy 21, we paddled through a small community on the left side of the river and we came upon a nice sandbar at marker 99. We decided to camp there and we quickly had our tents up and a fire cooking up some food. After dinner, I found a couple of hellgrammites under a limestone cobble. I rigged one up and cast to a 5 lb bowfin that quickly swallowed it. Our first night camping was restless and, as soon as the sky began to glow, we packed up camp and were on the river by 6:30. It was so much more comfortable paddling in the cool of the morning than the still afternoon heat of the day before. There were some really interesting rock outcrops and riffles that we floated through near marker 97. By 10 am, we had already paddled 10 miles and soon started hearing the distant roar of machines. As we approached I-95, the roar grew louder until it suddenly appeared around the next bend. There was a stark contrast between the bumper to bumper speedway above us and slow, consistent pace the three of us took on our path. Soon after I-95 another roar grew in the distance and we eventually paddled against an enormous building at the SCE&G steam plant complex. We took a break and stretched our legs at Colleton State Park. I was able to catch a ride to a small shop in Canadys for 2 more gallons of water and some boiled peanuts. We took a short break to swim above Stokes Bridge and we started finding numerous sharks teeth and fossilized bone fragments in the gravel on the riverbed. Within 15 minutes, we had found well over 100 sharks teeth and we hopped back in our boats to find a nice camp site. We passed another interesting rocky outcrop near marker 71 and we soon found a nice sandbar on the left side of the river at Cane Island. We quickly set up camp and got some rest after paddling a 28 mile day. The next morning, we broke down camp and were on the river shortly after sunrise to take advantage of the cool of the morning. We passed numerous river communities on river right and waved to a few folks who were also enjoying the beauty of the river at morning. As we paddled, the left bank of the river began to grow into a tall bluff and we knew that we were getting close to Givhans Ferry State Park. We pulled into the park around 11 am and we were hungry for breakfast. We had packed plenty of pancake mix, but no plates or spatula to flip them. Out of necessity, we invented a new meal we called “scrambled pancakes.” We continuously stirred the pancake batter mixed with dried cherries as the bottom of the pan cooked and hardened. The finished product was a bready, mixture that took syrup well and tasted just as good as any pancake I had ever eaten. We recharged our camera batteries, refilled our water jugs, and took a quick bath in the river before continuing our journey. As soon as we crossed under the Hwy 61 bridge, I swear that a mullet jumped right next to my boat. I was pretty amazed at the possibility that these saltwater fish would be so far up the river. We paddled through long straight stretches of wide, shallow river and several reaches of winding folds of river with side sloughs that seemed to extend endlessly into buttressed woods. The duck boxes marking the locations ended at Givhans Ferry and it became more difficult to know where we were on our map. We were hoping to camp on a large sandbar on river right about a mile above Martins Landing. Not knowing where we were, we passed it up hoping that a more suitable sandbar was just around the bend. When we reached Martins Landing, we realized the mistake we had made and we started looking for a nice place to camp in the woods. The sandbars had become less frequent and the large sandbar upstream from Martins Landing was the last sandbar we saw on the river. We continued paddling until we came to a place where the river split into several directions with islands that made for nice camping. We pulled our boats out and camped on one of those islands. There was a table built and it looked like this island has seen many travelers before. The camp site was near marker 37 and we laid down to rest after a 33 mile day. The next morning we rose to another meal of scrambled pancakes and, as we went to load our boats, we noticed that they were halfway in the water. I know that we had pulled the boats completely out of the water the night before and, at that point, we knew that we would be dealing with tides that day. The beginning of our 4th day was clear and breezy and we had soon reached Hwy 17. There was a sunken wooden boat that was sustaining a large community of plants about a mile below Hwy 17. The paddling became complicated as the river widened and the wind grew stronger. We had hoped for a relaxed day of paddling that would end near Willtown Bluff before we began our coastal trek, but we realized that the conditions were becoming more and more difficult. We stopped at West Bank landing and looked for some water to fill our dwindling supply but we found none. When we continued paddling we noticed that the current was pushing against us. It was as if the river had changed directions and we were now paddling upstream. We began to see so many alligators along the grassy bank that we lost count. As the day progressed, the winds and current grew stronger and we sought shelter in a long canal on the river right. The canal ended at a large rice chimney and an old plantation site. We walked around for a bit to regain our strength and ponder the extent of the operation that had once taken place at that remote site. When we returned to the river, the current was stronger than ever and the wind was whipping across the flat treeless marsh to create breaking waves on the river. If we took a short break from paddling, we would lose all the ground that we had just worked for. With the difficulty of the conditions and the lack of any high ground to wait out the tide, we were beginning to realize that we were not going to be able to continue like this for much longer. After a full day of paddling in the most difficult and unsafe conditions, we finally pulled up to Willtown Bluff and were relieved to be within arm’s reach of civilization. We decided to end our trip after that difficult 13 mile day due to the lack of a source of freshwater and any high ground for camping. During our trip we saw abundant wildlife and some of the most beautiful and diverse scenery that I have seen on any river. Regardless of what events may be happening in my life or throughout the world, the river continues its unimpeded and meandering journey out to the great sink of the Atlantic. I take comfort in that fact knowing that if I ever need a break from my routine, the river will be a willing carrier of my gear for the next adventure. 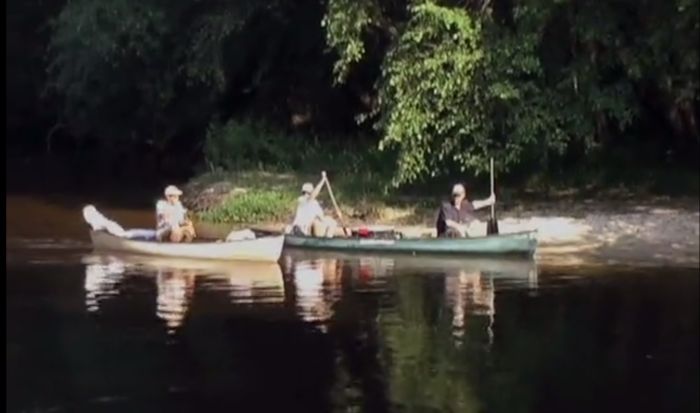 The Edisto is truly a world class river for paddlers, fishermen, and other adventurers.